The present site is the property of the Etablissement public du château, du musée et du domaine national de Versailles, a national public institution with an administrative character under the aegis of the Ministry of Culture and Communication, whose Siren number is 180 046 260. Its head office is at the Château de Versailles – RP 834 – 78008 Versailles (e-mail ; telephone: + 33 (0)1 30 83 78 00 ) and its intracommunity VAT number is FR 15180046260. The website's editor-in-chief is Catherine Pégard, in her capacity as president of the Etablissement public du château, du musée et du domaine national de Versailles. The publication manager is Ariane de Lestrange in her capacity as director of information and communication of the Etablissement public du château, du musée et du domaine national de Versailles. Claranet, whose contact details are 68, rue du faubourg Saint Honoré 75008 Paris FRANCE (phone: +33 (0)1 70 13 70 00) hosts the www.chateauversailles.fr website. Internet users visiting the site acknowledge that they have read and agree to comply with the present legal information. The Etablissement public du château, du musée et du domaine national de Versailles does its utmost to ensure that the information on its site is as available, accurate and up to date as possible and reserves the right to correct its content at any time without notice. However, the Etablissement public du château, du musée et du domaine national de Versailles cannot guarantee that the information is as available, accurate, up to date or comprehensive as possible. Internet users fully accept the risks relating to the credibility they give this information and accept using it under their sole responsibility. Users are informed that the Etablissement public du château, du musée et du domaine national de Versailles, responsible for processing, processes personal data for the purposes of information and external communication, satisfaction surveys, newsletter subscriptions, order management and tracking, commercial relations management and tracking and public management and tracking. To do so, the Etablissement public du château, du musée et du domaine national de Versailles may ask users to submit their contact information and electronic or postal address. The data collected are intended for the information and communication department, administrative, financial and legal department, the accountant, and the cultural development department of the Etablissement public du château, du musée et du domaine national de Versailles, as well as the for the service providers of the Etablissement public du château, du musée et du domaine national de Versailles. By virtue of article 34 of law 78-17 of 6 January 1978 on information technology, files and liberties, users have the right to access, modify and correct data about themselves, as well as the right to oppose for legitimate reasons processing of the data concerning them, and to oppose sales canvassing, by writing to the website's operator, whose address is the following: Etablissement public du château, du musée et du domaine national de Versailles – Information and Communication Department– RP 834 – 78008 Versailles. The present site is not intended to receive confidential information, with the exception of the personal data mentioned above. Therefore any information that internet users communicate cannot be considered confidential whatever the form: documents, data, graphics, images, questions, suggestions, concepts, remarks or other. The transmission of information to the site therefore gives the Etablissement public du château, du musée et du domaine national de Versailles the right to use, reproduce, disseminate, modify or transmit it in order to process the internet user's request. Users are informed that a cookie may be automatically installed on their browser software while visiting the site. The cookie is used to record information about the users' browsing but does not make it possible to identify them. Users can set their browser software's parameters to make it possible to inform them of the cookies' presence and of the possibility of refusing them in the manner described at the following address: http://www.cnil.fr. Users have the right to access, remove and modify personal data communicated by cookies in the conditions indicated above. Users of the www.chateauversailles.fr website are expected to comply with the articles of law 78-17 of 6 January 1978 on information technology, files and liberties, and violators are subject to prosecution. In particular, they must refrain from collecting and improperly using name-specific information to which they have access and, generally speaking, committing any act that may infringe upon the privacy or damage the reputations of persons. Likewise, the website's users acknowledge and agree to send the Etablissement public du château, du musée et du domaine national de Versailles only e-mails containing the information necessary for processing their requests and to refrain from to making any extremist, racist or pejorative comments. Unless otherwise mentioned, any item in the site (general structure, software, texts, animated images or not, sounds, know-how, etc.) is the property of the Etablissement public du château, du musée et du domaine national de Versailles or its partners and subject to copyright laws. No license, nor any other right other than that of consulting the site, is granted to anyone with regard to intellectual property rights. Reproduction of the site's documents is allowed only for the exclusive purposes of information for strictly personal and private use. Any reproduction and any use of copies made for any other purposes and in any other framework are expressly forbidden and constitute an infraction sanctioned by articles L. 335-2 and following of the Intellectual Property Code. The same is true for any databases that may appear on this site that are protected by the articles of law 98-536 of 1 July 1998 transposing the European directive of 11 March 1996 on the legal protection of databases to the Intellectual Property Code. Unless otherwise mentioned, the corporate names, logos, products and brands mentioned on this site are the property of the Etablissement public du château, du musée et du domaine national de Versailles or its partners. Their total or partial reproduction based on items on the site without the site operator's express consent is therefore prohibited in the sense of article L. 713-2 of the Intellectual Property Code. The Etablissement public du château, du musée et du domaine national de Versailles cannot be held responsible for users' access to other internet resources via the hypertext links created in the framework of its site. The Etablissement public du château, du musée et du domaine national de Versailles therefore formally declines any responsibility for the content of the other sites to which it offers links, which are only offered to this site's users as a service. The decision to activate the links is the internet user's sole decision and responsibility. This document presents information concerning the cookies found on services (“Services”) accessible to all internet users with a connection terminal (computer, tablet, smartphone, etc.) from the following address: www.chateauversailles.fr (“Site”). Cookies may be installed automatically on the user’s terminal (computer, telephone, tablet, etc.) during visits to the Site. Cookies are used to save information relative to the user’s browsing in order to provide him/her with personalised navigation (e.g. user identification to access their account, managing their shopping cart, memorising consultations and personalising the offers proposed). Users are informed by a banner that cookies are installed on their terminal when they arrive on the Site’s homepage. If they continue to browse the Site without configuring the gathering of personal identifiers, they accept the collection of this information and the creation of the personal identifier. Users can disable/delete these cookies on their terminal, but if they do so will no longer be able to use a certain number of functions that are nonetheless needed to browse certain areas of the Site. The Site uses the Google Analytics software to analyse certain bits of information about visitors such as traffic, use of the browser, number of new visitors, marketing activities and pages viewed. This information helps us to make improvements to the Site, both qualitatively and quantitatively. The data saved by these cookies can only be viewed by the concerned teams at the Site, but no confidential information is recorded. The Site uses the function for “sharing” content with the user’s friends through social media. When the user “shares”, these social network websites may send cookies to the user while browsing the Site. The Site has no control over the distribution of these cookies; we therefore suggest that you consult the third-party websites for more information about their cookies. Most browsers automatically accept cookies by default. The user can nonetheless configure his/her browser to keep cookies from being saved on the computer or on a related peripheral device. Some browsers offer a method by which cookies are always deleted after a visit. The user can also configure his/her browser software so that it indicates the cookies placed on the terminal and lets you choose whether to accept these cookies or not on a case-by-case basis. It should be pointed out that if the user disables cookies, access to all or part of the Services offered on the Site may be reduced or blocked. If the browser is configured to refuse all cookies, the user will notably not be able to use essential functions on the Site. To carefully manage cookies, the user should configure his/her browsers taking into account the cookies’ purpose as indicated above. Find the files containing the name “chateauversailles”. Select them and delete them. Select the cookies containing the name “chateauversailles” and delete them. 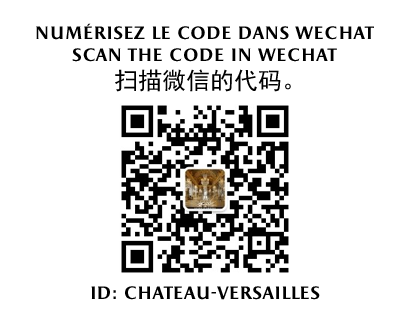 Select the cookies containing the name “chateauversailles” and click on Delete or Delete all. Terms and conditions of sale for: guided tours for groups, private tours, "Versailles education", "Versailles for all"